Are your bones and joints starting to cause a little pain? If you are over 60, do you look different when you walk than you did when you were forty? Are you getting shorter. Are your back and shoulders more slumped? These signs of aging have become acceptable, but it doesn't have to be that way. Have you ever noticed a man or woman in their eighties walking square shouldered with a straight spine, arms swinging with elbows close to their sides, thumbs forward? Try walking like that. That's probably how you looked 20 or 30 years ago. Would you like to look and feel like that again. It may just be possible but it takes life style changes and a conscious effort. A variety of things happen to the body as it ages. It is a process that occurs naturally unless we consciously try to halt or reverse the process. Here are some of the things that happen naturally. The mineral content of bones decreases, so that they become less dense and more fragile. As they lose mass, osteoporosis develops, affecting both women and men. In the spine, osteoporosis can lead to crush fractures of the vertebrae, resulting in a "dowager's hump." Osteoporosis is also responsible for almost all hip fractures in older men and women. The chemistry of cartilage, which provides cushioning changes. With less water content, the cartilage becomes more susceptible to stress. As cartilage degenerates, arthritis can develop. Ligaments become less elastic, reducing flexibility. Vertebrae lose some of their mineral content, making each one thinner. The spinal column becomes curved and compressed. Some of the most common ailments that come with aging can be dealt with naturally. Osteoporosis is a disease that thins and weakens bone tissue, leaving the bones less dense and prone to fracture. Although there is no cure for osteoporosis,it is both preventable and treatable. Osteoarthritis is a degenerative disease that often involves the hips, back, neck or other joints. Typical symptoms can range from stiffness and mild intermittent pain, to severe joint pain. Some slowing of the degeneration and relief from pain can be achieve through diet, exercise and supplements. Rheumatoid arthritis is an autoimmune disease that causes the body to release enzymes that destroy the linings of the joints. Exercise is one of the best conventional treatments for joint pain. Many of the changes in our musculoskeletal system result more from disuse than from simple aging. Fewer than 10 percent of Americans participate in regular exercise, and the most sedentary group is older than 50 years of age. A healthy diet, regular exercise program, and positive attitude can help delay the onset and slow the progression of many age-related changes. http://www.rheu-osteo-jra.com/index.html ...It is a sad day to see someone gnarled and crippled over with painful joints. Rheumatoid Arthritis is the most crippling of all arthritis. Investigate causes, options, medications, NSAIDs, common symptoms, side effects, treatments and diet. 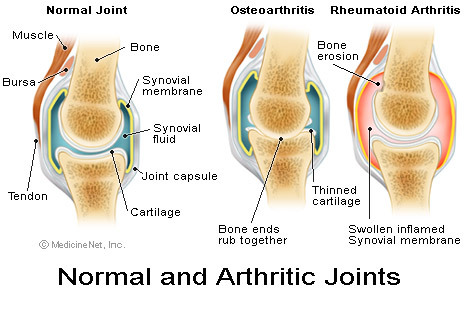 JRA to Osteoarthritis to Rheumatoid Arthritis, you'll find the human side.